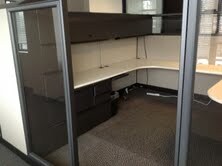 Knoll Dividends 8×8 and 6×6 workstations. Lots of glass! Full pedestals and closed overhead storage. Product is in good as-is condition and available now.